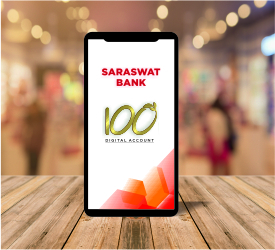 Now open your smart savings account with your own Desired Account Number with Saraswat Bank’s ‘Saraswat Bank 100’ mobile app! On the premier occasion of Bank’s Centenary year, we welcome you to a new way of Digital banking that helps you enrich your experience more with Saraswat Bank. ‘Saraswat Bank 100’ is a simple, seamless and secured way to open a Savings account with Saraswat bank. ‘Saraswat Bank 100’ is a multilingual mobile application, facilitates you to open Aadhaar OTP based savings account without any paperwork or even without stepping out of your home or office round the clock. Further, after activating your account, you can transfer funds online through IMPS / NEFT, create deposits, generate Digital Debit Card, scan & pay with Bharat QR etc with comprehensive ‘GoMo Mobile Banking application’. Just keep your Aadhaar & PAN number handy! Open your Smart Savings Account with your own Desired Account Number with our ‘Saraswat Bank 100’ mobile app! Instantly get your account number of your choice through a simple on-boarding process.